Mozart 'Jupiter' Symphony - a performance of style with a true feeling of spontaneity. The outer movements were full of vigour and dramatic contrasts. The weighty tuttis contrasted well with the transparent treatment of the lightly scored passages. 'Cockaigne' Overture - the unmistakeable Elgar sound was beautifully portrayed by the Southern Pro Musica in their superb performance of the overture.The musicians captured the bustle and panoply of London and created the rare power of the music with their vital and vigorous playing. Throughout the work, the immediacy of the instrumental colours was a reminder of the superiority of a live performance over a CD. Bursts of timpani exploded in the introduction; the flute explored its warm low register in the tune so reminiscent of 'Swing low, sweet chariot'; cellos danced their counter-melodies in the last movement, and the cor anglais revelled in the theme of the Adagio, – a melody that has become almost the signature tune for the instrument. Equally impressive was the energy and ensemble of the full orchestra, as the outer movements built up in tone and tempo towards their powerful conclusions. 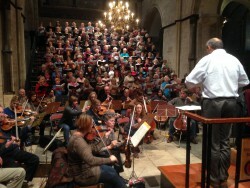 Southern Pro Musica goes from strength to strength. From the opening of the Overture, Southern Pro Musica showed precision and sensitivity with a lightness of playing that might normally be associated with performances on 'baroque' instruments, rather than their modern equivalents. Southern Pro Musica is an orchestra of distinction - lively and accurate, producing a wonderfully bright sound. 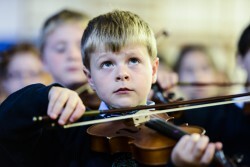 Played with great control and vigour, a first class evening of orchestral string playing to the highest standards. SPM deserves to win a strong local following from Guildford residents based on this performance.